Thanks to Dr. Tim Bracey, Royal Cornwall Hospital (United Kingdom), for contributing this case. To contribute a Case of the Week, follow the guidelines on our Case of the Week page. (1) Support PathologyOutlines.com by doing your holiday shopping at Amazon.com. Click here, or on any Amazon banner on the left side of our Home Page to visit Amazon.com. By visiting Amazon via these links, they will send us 4-5% of the cost of all items you purchase (out of their profits), at no additional cost to you. (2) We are currently updating topics one at a time in the Bladder, Cervix-Cytology and Coagulation chapters, and hope to have the chapters completed soon. 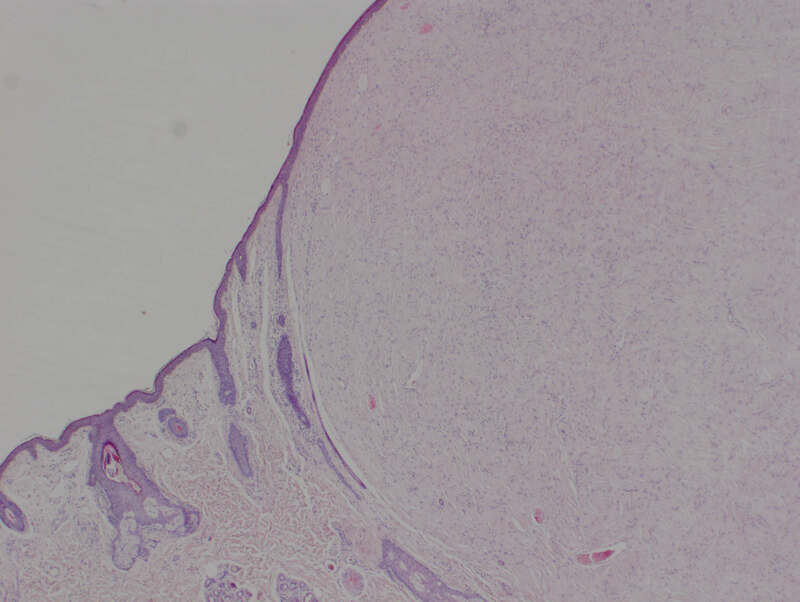 A 60 year old woman with no previous history had an ellipse of skin submitted from her right cheek, with a clinical diagnosis of basal cell carcinoma. 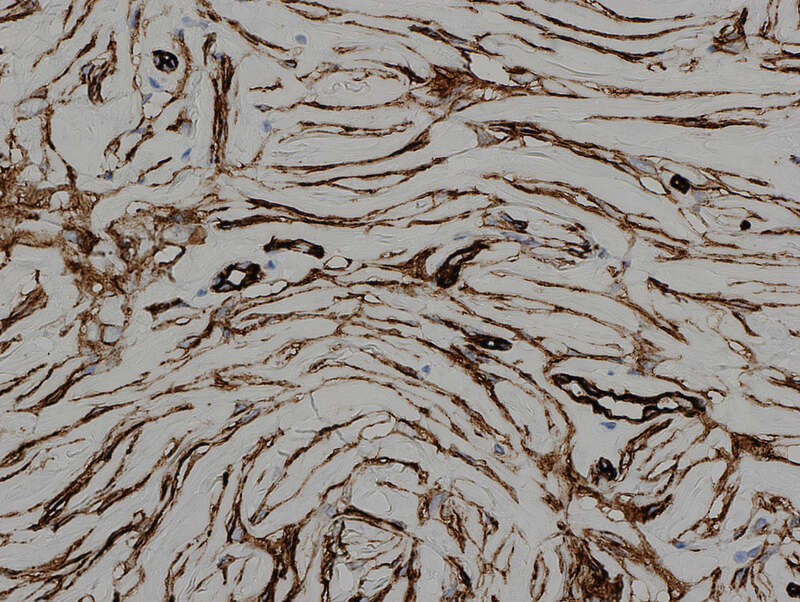 Storiform collagenoma, first described in 1991 (Am J Dermatopathol 1991;13:122), is a well circumscribed, hypocellular lesion with focal, heavy collagen deposition in a distinctive interweaving, storiform pattern, with prominent elongated clefts between the collagen bundles. Multinucleated giant cells have been described (Am J Surg Pathol 1998;22:557). Solitary lesions are also called sclerosing fibroma. Storiform collagenoma usually occurs in young and middle aged adults, and presents as a slow growing solitary nodule up to 1 cm on the head, neck or upper extremities. It may be solitary, but multiple nodules are associated with Cowden's disease (eMedicine), a rare, autosomal dominant disorder with multiple hamartomatous neoplasms of ectodermal, mesodermal and endodermal origin; an increased risk of breast, thyroid or endometrial carcinoma; and disorders of the CNS, musculoskeletal system, GI system and female genital tract. Rarely, storiform collagenoma may be the presenting feature of Cowden's disease (J Clin Pathol 2007;60:840). Cowden's disease is considered part of the spectrum of various disorders with mutations in the PTEN gene, which collectively are termed PTEN hamartoma tumour syndrome. 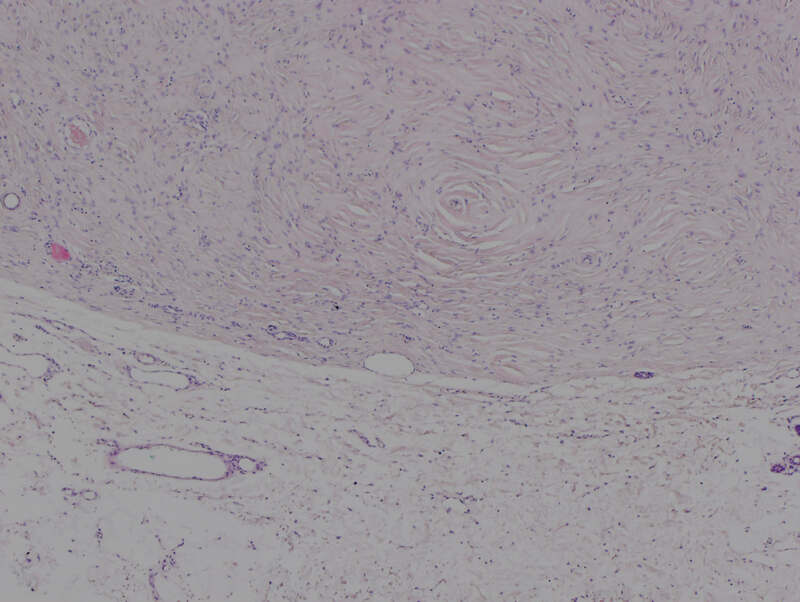 The nodular stells are often immunoreactive for CD34 and vimentin, with prominent reticulin fibers. Scattered dendritic cells are factor XIIIa positive. The nodules are negative for keratin, EMA, CEA and elastic stains. These tumors have benign behavior, and no treatment is necessary. Solitary tumors may be excised for cosmetic reasons.